Arthur A. Levine Books, 9780545457811, 40pp. 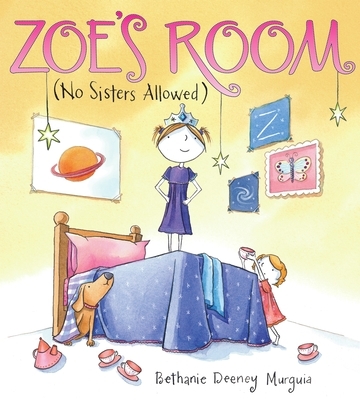 Zoe is the Queen of the whole Universe... but her favorite place in the Universe is her own room, where she hosts tea parties, builds empires out of blocks, and gazes out upon the stars. Then her parents announce that her little sister Addie is moving in to Zoe's room. Little sisters aren't good at tea parties (too rude), block-building (too clumsy), and starwatching (just plain too young!). So the Queen's new roommate is a royal pain... until Zoe discovers that even her smallest subjects can be useful in a storm!